If your have clients worldwide and want to make a call. You can change your ID caller. So you will be able to call them from the number you want with the local cost. 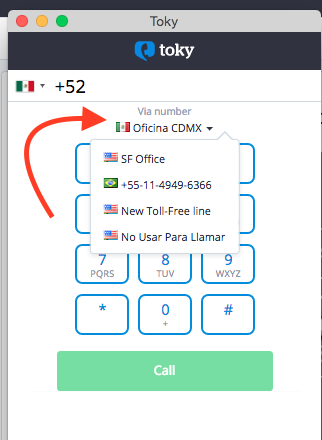 Go to your Toky Dashboard and click on Phone Call or click on your Toky's Chrome Extension dialer. Once the dialer appears. Click on Via Number and you will have all the options. You will make the call from the number or office you choose.